We have all experienced this. You know, that lonely, hindsight realization that we are trying to do too much. That maybe, maybe we should have said no. If you ever find yourself in that place, overwhelmed with commitments, each of which as worthy as the next, all of which are too important to give up, you don't know how to create space, and you just can't bring yourself to say no, then this is the book for you. If you've ever been stuck in a cycle with a loved one or a friend where you feel taken advantage of, or even just taken for granted, you might even stand up for yourself, or create distance from that friend, only to find yourself in the exact same position with the same person or someone new, then this is the book for you. Come alongside author Amy Copeland as we take on the mammoth task of learning why "No!" can be the best thing for everyone, and then actually go about the task of doing it, one boundary at a time. 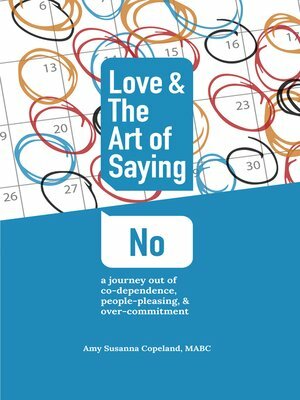 Love & the Art of Saying No begins with the author's confession of a personal guilty-pleasure habit that reveals a deeper fascination with behaviors and a desire to help others. In her own journey, Amy Copeland, a pastry chef-turned-counselor, discovered helpful truths about codependence, people-pleasing and over-commitment that she shares in this practical book. Part memoir and part self-help, Love & the Art of Saying No takes the reader through the author's story, articulates the lessons learned, and offers opportunities to "Practice Your Art" through reflection and encouragement. If you've ever felt taken advantage of, taken for granted, or overwhelmed with the weight of your responsibilities, it may be time to learn that sometimes saying "No" is the most loving thing you can do. Loving well and caring for the people in our lives need not induce stress and anxiety. Copeland offers understanding of the psychology of behaviors as well as practical solutions in this highly relatable book.